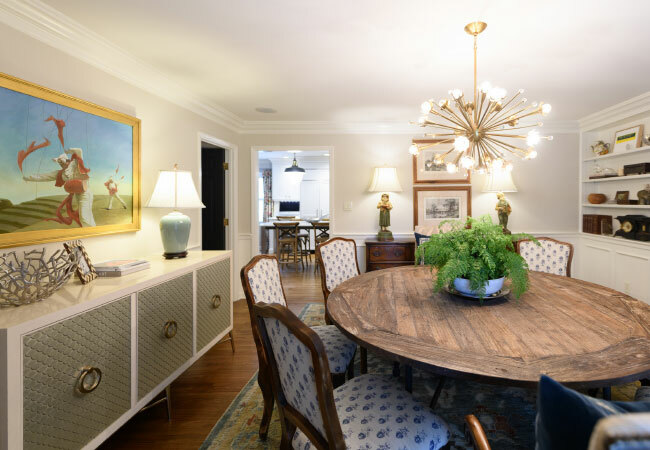 Inspiring renovations transform one of Lexington’s most desirable neighborhoods. 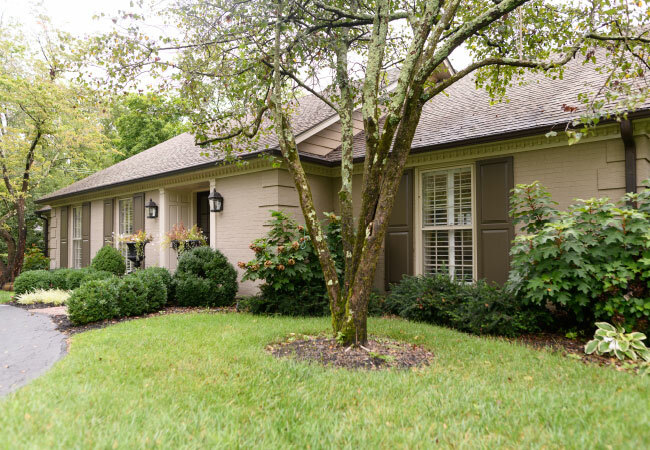 With its close proximity to downtown and the University of Kentucky, excellent schools and actively involved community members, Lansdowne is arguably one of the most desirable neighborhoods in Lexington. 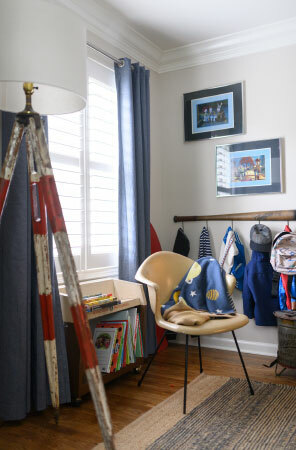 But while the district’s 1950’s and 60’s homes are appealing and well-constructed, many are in need of modern updates. Despite that, housing is a hot commodity in 40502. Even “fixer-uppers” sell the day they go on the market, and usually above asking price. And since the area has been established for decades, there is little room for new construction. For those looking to buy in Lansdowne, updates to the existing property are often necessary. 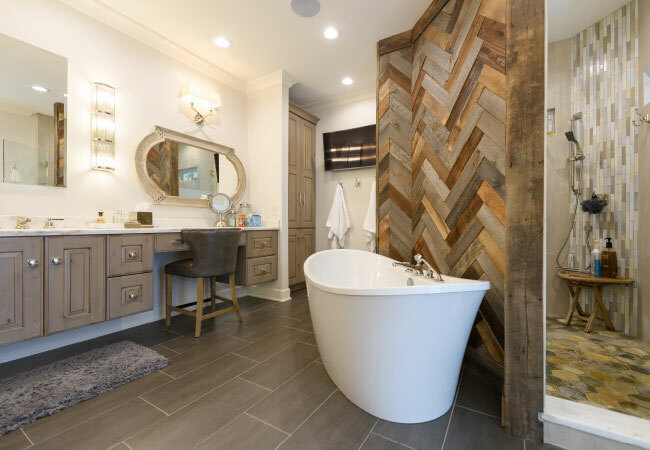 Enter Derrick Whitaker of Creative Kitchen and Bath, who has been designing and decorating homes for decades. 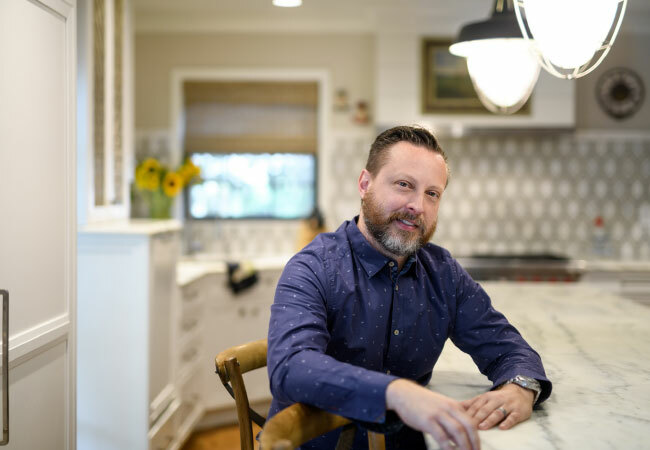 Whitaker has a degree in interior design and while he chooses to focus on kitchens and baths primarily, he is happy to help his clients in all aspects of home design. Whitaker has taken a keen interest in modernizing some of the homes within the Lansdowne neighborhood, including his own home! Whitaker’s partner Ted Schaffhauser is a stay-at-home parent to the couple’s five adopted children, whose ages range from four to seventeen. 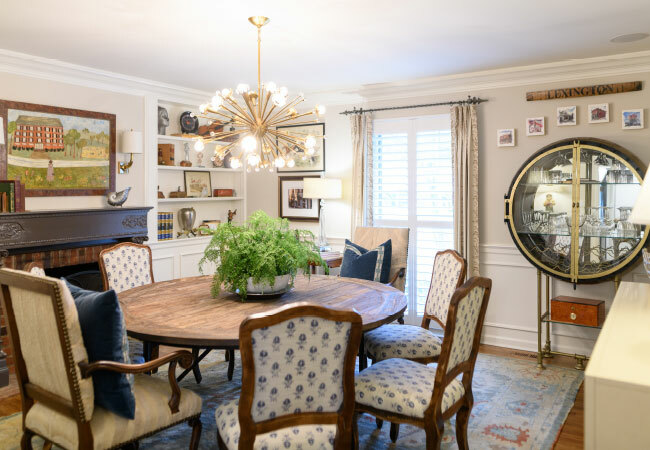 When it came time to decorate and design their home on Cloverdale Drive, they focused on a functional, family-friendly look that has plenty of style at the same time. Interestingly, the morning they closed on the house eleven years ago was the same day they were approved to adopt their three oldest children. “We actually all met and moved in the next day, it was a whirlwind,” said Whitaker. The Cape Cod style home was built in the late 1960’s and is situated on the end of a quiet, low-traffic street. The brick exterior was painted a year after they moved in. 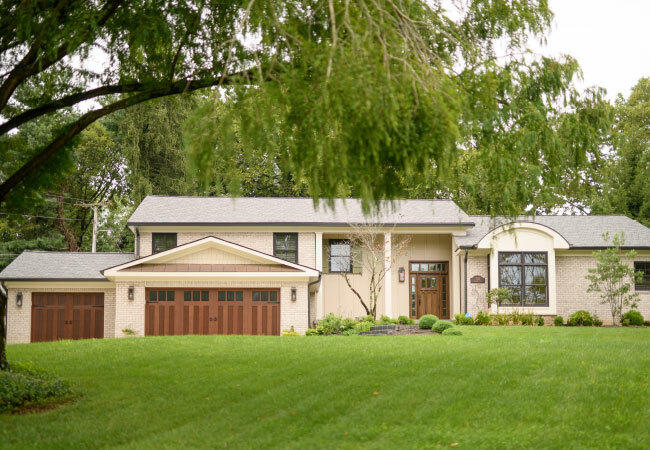 They replaced the roof with a 50-year dimensional shingle, replaced the wood exterior with Hardie Board siding and added copper gutters, chimney pots and board-and-batten shutters. They replaced the solid wood front doors with glass to bring in more natural light. Their next project will be to add gas lanterns at the entryway. 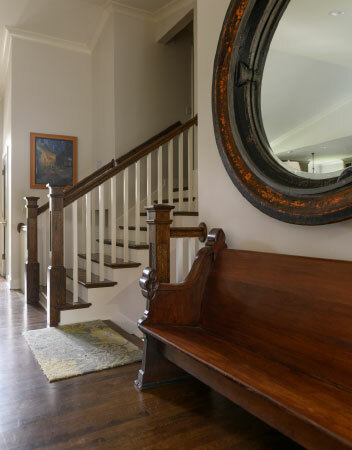 The home’s interior features an eclectic mix of styles, accented with a large, colorful art collection. “I just buy what I like and try to make it work." He mentioned that much of the art collection is sourced from Main Cross Gallery, Wills Gallery, as well as Keeneland’s Fall art auction. 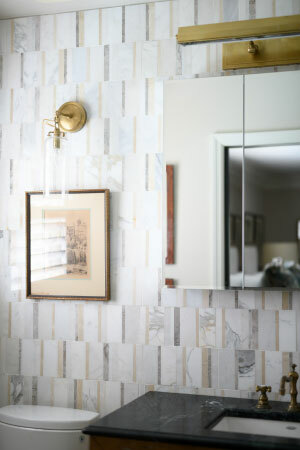 Much of the ground floor’s wall covering is a Ralph Lauren grass cloth wallpaper that Whitaker is updating by painting vertical white stripes. It’s a clever way to give new life to an investment without spending too much. 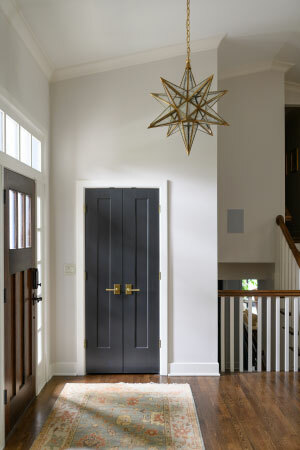 The soft gray interior paint used throughout the home is Sherwin Williams’ City Loft. 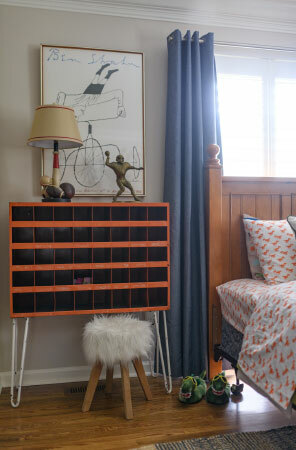 While the décor is peppered with a few amazing vintage finds, most of his new furniture is from Norwalk. “I have been working with them for over twenty years,” Whitaker said. 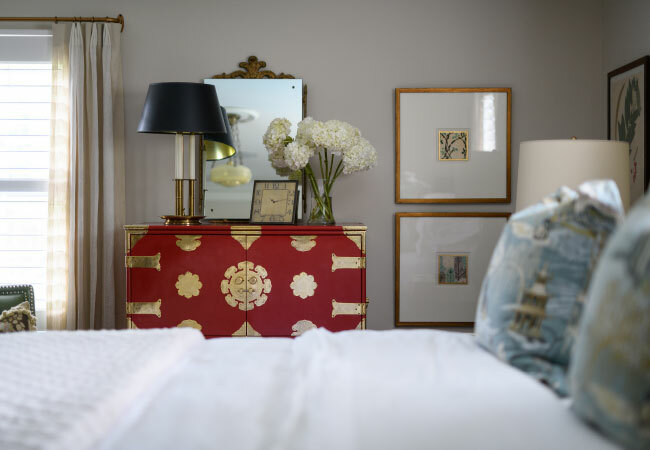 “They are a great source for furniture and have an incredible wallpaper and accessories collection as well.” He tends to buy his decorative pieces from Thoroughbred Antique Gallery and Claiborne Antiques and he’s also a big fan of L.V. Harkness and Scout Antiques and Modern. The original quarter inch oak jest floors were hidden beneath wall to wall carpet. Whitaker recently redone in a provincial finish. 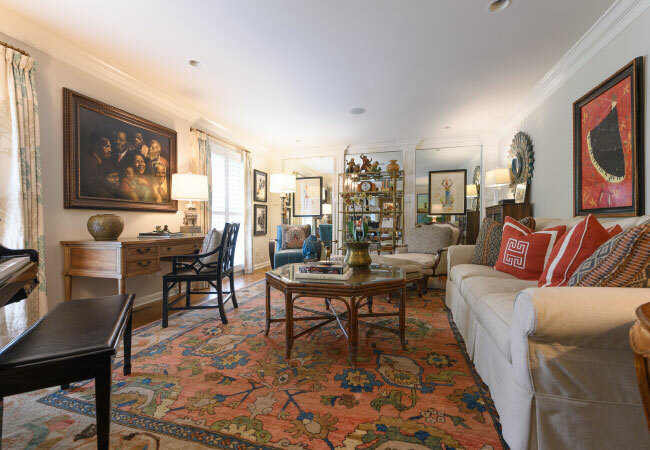 The couple loves antique rugs and always works with The Rug Gallery in Brannon Crossing. 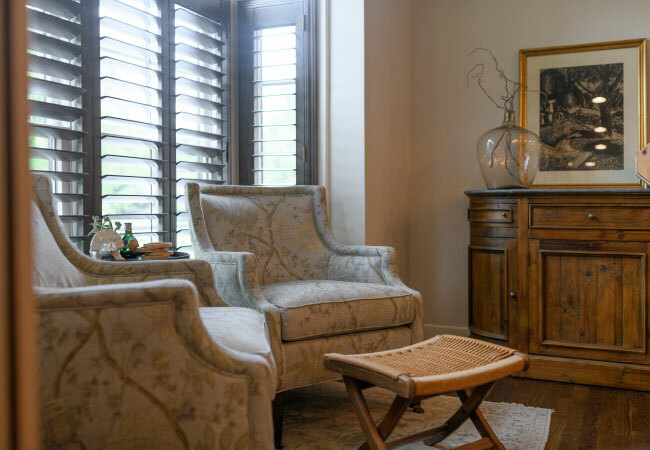 For the windows, they used three and a half inch plantations shutters as well as custom fabric treatments throughout the home. 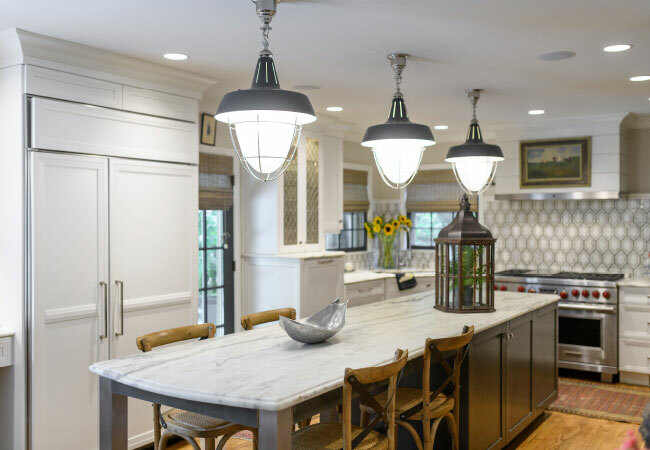 Whitaker said his favorite part of this home is the kitchen, and aside from the design, he also supplied all the plumbing fixtures, tile and lighting. The family spends most of their time in this room, along with the adjoining sitting room and pool patio area. 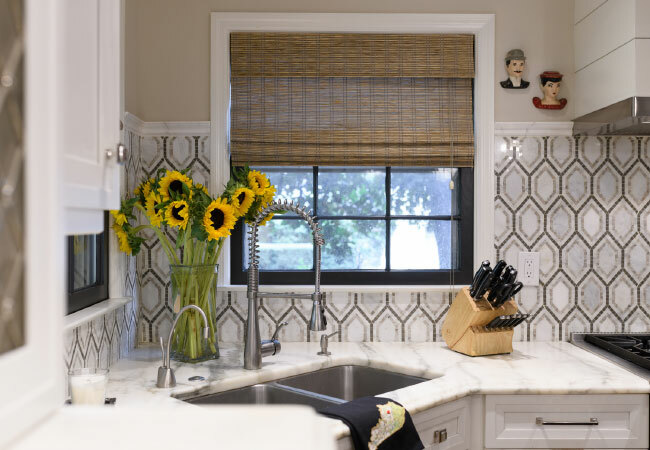 The extra-long marble countertop is a perfect example of beauty and function. It’s a natural gathering place for the family to eat breakfast or the kids to do homework. 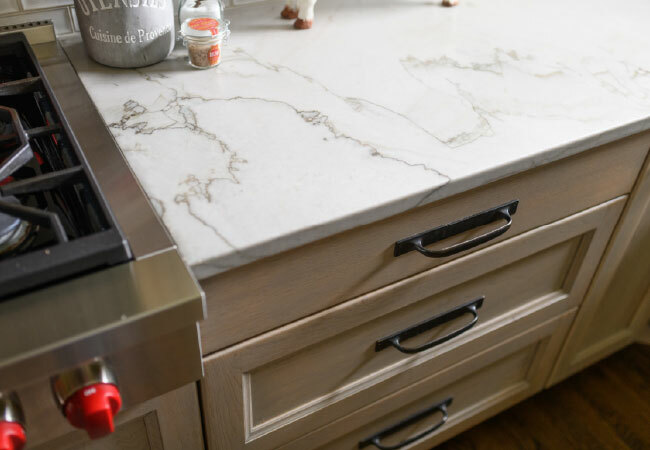 The hard wood floors add a touch of warmth and the backsplash, which is made from marble in varying colors, adds a touch of personality and luxury. 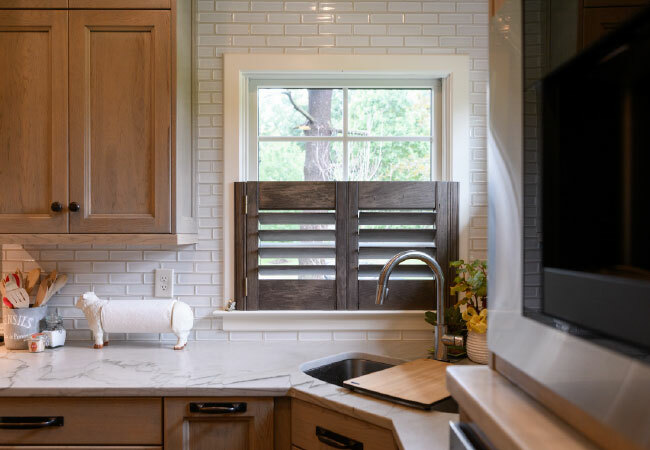 The cabinets lining one side of the kitchen and around the island are painted a contrasting brown, a design choice that Whitaker has admired for a long time. 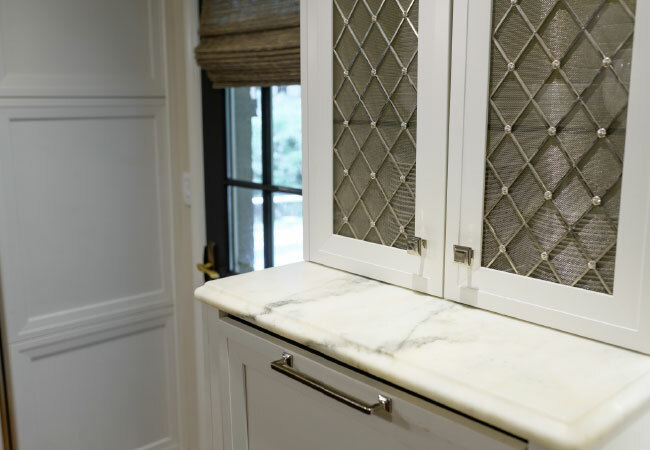 One of his favorite kitchen features is the elevated dishwasher – no bending over required. 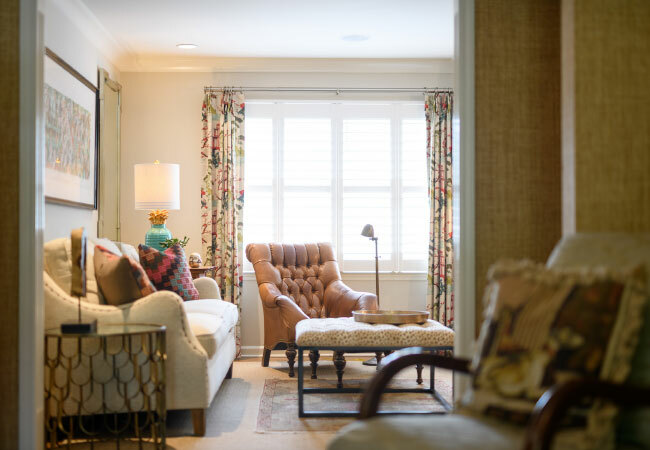 A little ways down the street is another home that Whitaker and his team helped to transform. In this case, the word “remodel” is a bit of an understatement. The home was taken down to the studs and completely rebuilt. Many Lansdowne homes have been occupied by original owners, and this one was no exception. In fact, the interior and exterior features were updated very little since it was built in 1959. The homeowners had been living in Lansdowne for some time, and were looking for a home in the neighborhood that met their changing needs. 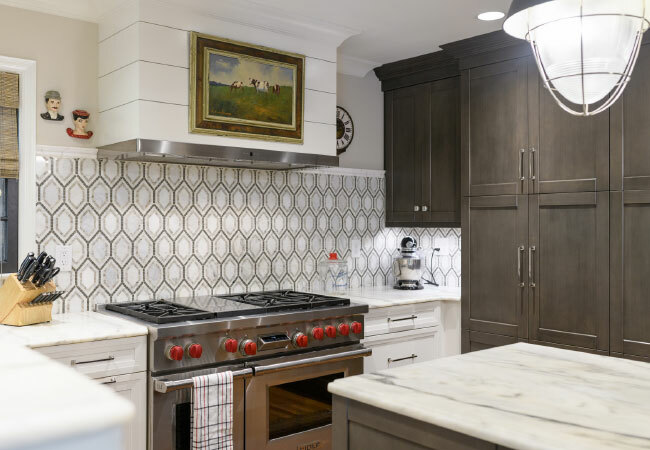 When they first looked at the property, they described it as a “time capsule” – the kitchen was straight out of the late 1950’s, complete with copper brown double wall ovens. The fireplace was made from glazed green tile. 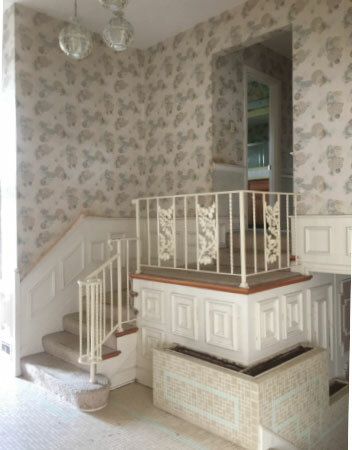 And the stairways were accented with floral wrought iron balconies painted white. 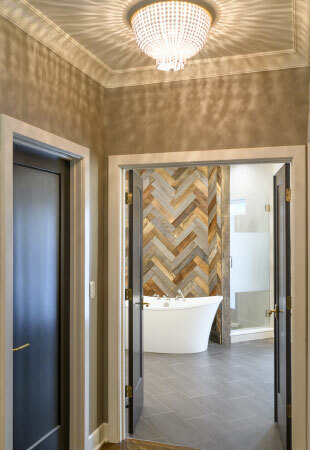 The homeowners hired Whitaker to help them take their home into the 21st Century, trusting him with nearly every aspect of the building and designing process. 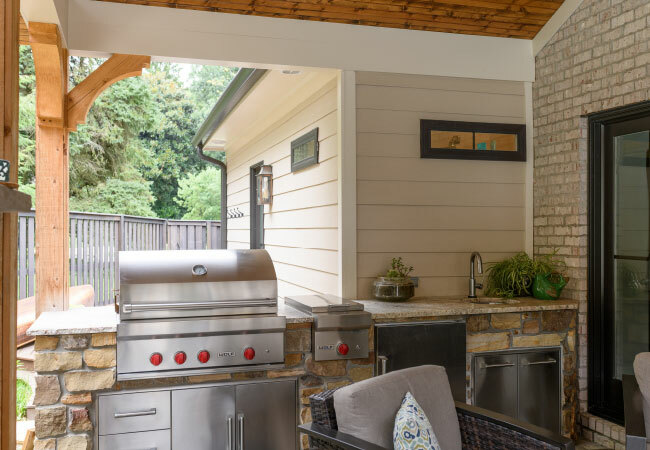 Over the year-long rebuild, Whitaker served as the sole interior designer and project manager. The only exception was the in-ground pool, which was designed by landscape architect Rick Rushing. 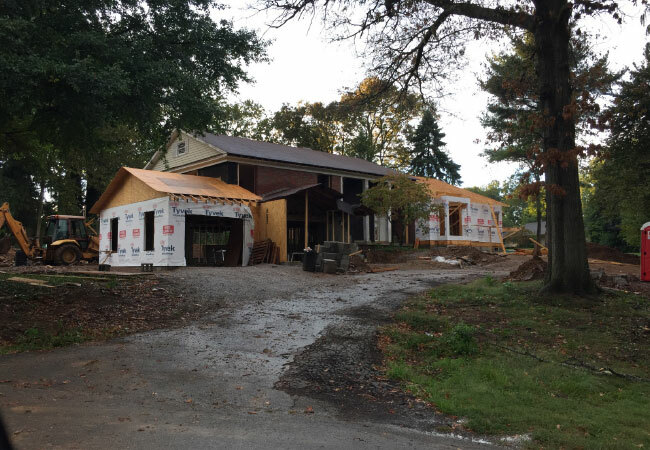 The process went smoothly for the most part – the only challenge was when the exterior brick began to fall off the house during the initial phases of the rebuild, forcing them to re-brick the entire home. In addition, a large amount of landscaping and trees were removed from the front of the house, allowing the carefully chosen exterior details to shine. 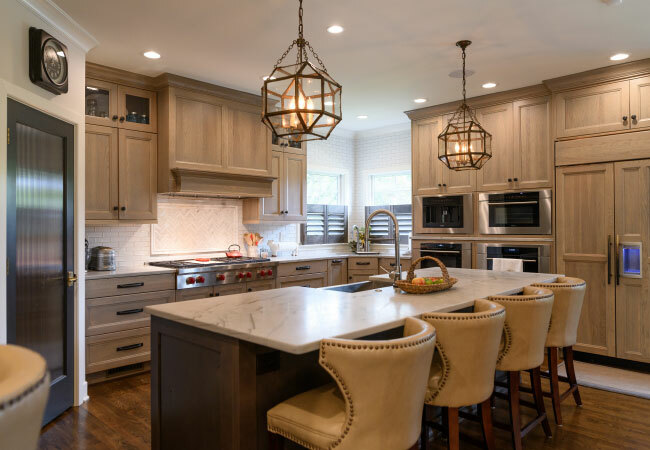 When asked what makes this home work so well for their family, the homeowner mentioned that the open concept kitchen, living and dining area keep the whole family together. Since the couple loves nature and the outdoors, their taste is inspired by Restoration Hardware, Arhaus and classic botanical and Audubon prints. They love to entertain and designed the home with that in mind. 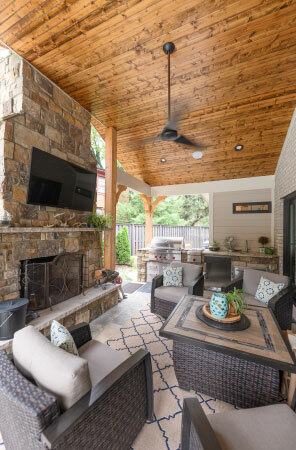 The main living space flows seamlessly onto the covered porch with a wall of French doors, and the attic was removed, creating a beautiful pitched ceiling. 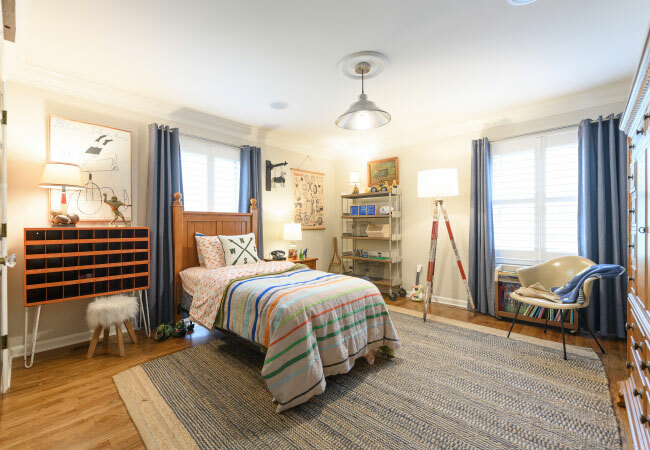 The kids have bedrooms upstairs, along with a dedicated guest suite that was the original master bedroom. 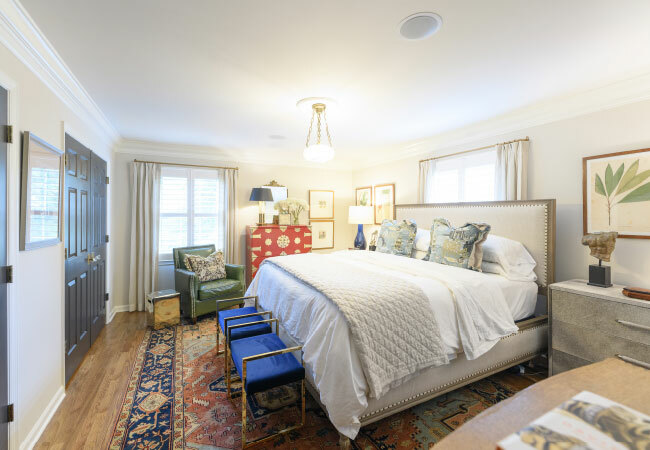 The first-floor addition allows the couple to have a beautiful master suite on the main floor. They both agree that this is their “forever home” and designed it so they can age in place. With unique chandeliers and a gorgeous color palette of muted grays and pure whites (they also used Sherwin Williams’ City Loft), the atmosphere is both luxurious and relaxing. “Working with Derrick was our favorite part of the process. He has a great eye,” they said. 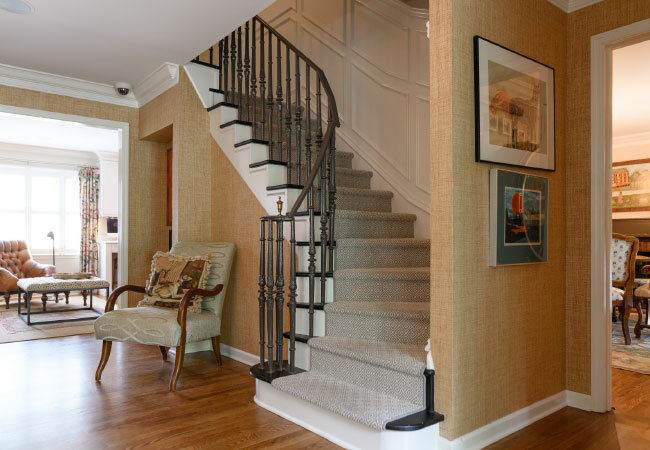 By being mindful of the homes, their age and the area, Whitaker makes it possible to take older Lansdowne homes and modernize them to meet today’s lifestyle expectations. His efforts are bringing new life (and happy new homeowners) to one of Lexington’s most celebrated areas. Said the homeowner, “I like to think that even though it is essentially a brand new house, it still fits into the architecture of the Lansdowne neighborhood."